I envy people who are organized enough to make lists. I’m even more impressed when the list is numbered. 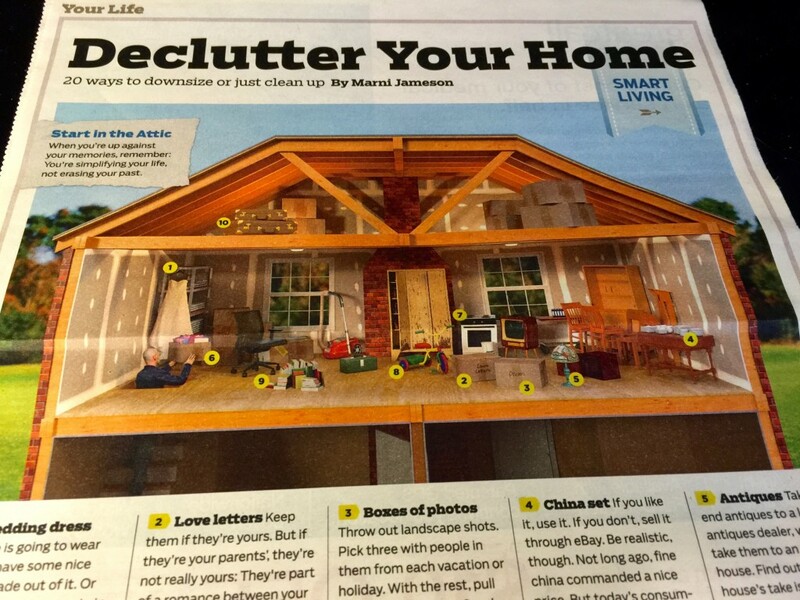 The above article, “Declutter Your Home, 20 ways to downsize or just clean up” told me I could put my organizational problems in Marni’s competent hands. Can you tell I’m a former librarian? I’m also a recovering self-help addict. At one point during my library tenure, I spent a good part of my leisure time studying how to get organized. How to use my time more efficiently. How to make myself a better person, a more organized person, a more efficient person. At the height of my obsession with efficiency and total self improvement, I looked in BOOKS IN PRINT to see just how many titles began with “How to . . . ” or “What to . . .” or “Simplify your . . .” or . . . The number of self improvement titles was mind boggling (an Oklahoma term). Even more “mind boggling,” I had an inordinate number of those titles at home, clogging my bookshelves and sending me on painful guilt trips. I’m surprised my family didn’t do an intervention. Time passed. The self-improvement books kept arriving in our home and gathering dust on our shelves. Then, not too many years ago, we left a home in Oklahoma City where we’d lived for many years and moved to Colorado. Now moving for many is not that traumatic. Load a few suitcases, get some packing boxes from Lowe’s or Home Depot along with bubble wrap, and you’re in business. Our downsizing was not an easy process. My husband and I approached the task in two totally different ways. His preferred solution seemed to be to dump everything but the clothes, tools and the kitchen utensils and call it good. Mine was an effort to not lose anything of value from our past lives. The jury is still out on a definition of “value” and just how much of one’s past life is worth keeping in the first place. It finally dawned on me as we looked over the piles and stacks and boxes of books on getting organized and decluttering my home and my life, that the old Nike slogan, “Just do it,” was probably more effective than all of the books. A lot quicker also. We made it to Colorado, our marriage still intact, and managed to find corners and cubbyholes for the items I couldn’t part with. Now I’m faced with this article, “Declutter Your Home,” taunting me with the possibility at this late date of actually becoming organized, and reminding me again, of all the boxes and boxes filled with items I couldn’t part with. Maybe my husband’s instinct was right after all.